A 47-year-old lady had a cyst and the teeth #6 and 7 removed 20 years ago. There is severe recession around the fixed prosthesis (Fig.1) with bone atrophy (*). 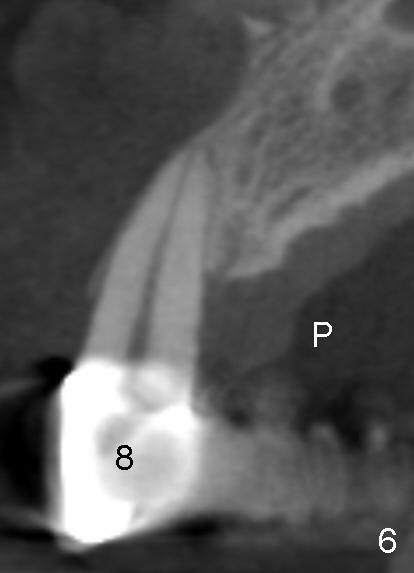 Recently an apparently perio abscess develops palatal to #8 (Fig.6 (CT coronal section)). It appears necessary to reconstruct this region. One stage procedure is planned to reduce surgical difficulties (mainly separation of the soft tissue in the later stages of surgery). The fixed prostheis is removed for better exposure and incision. 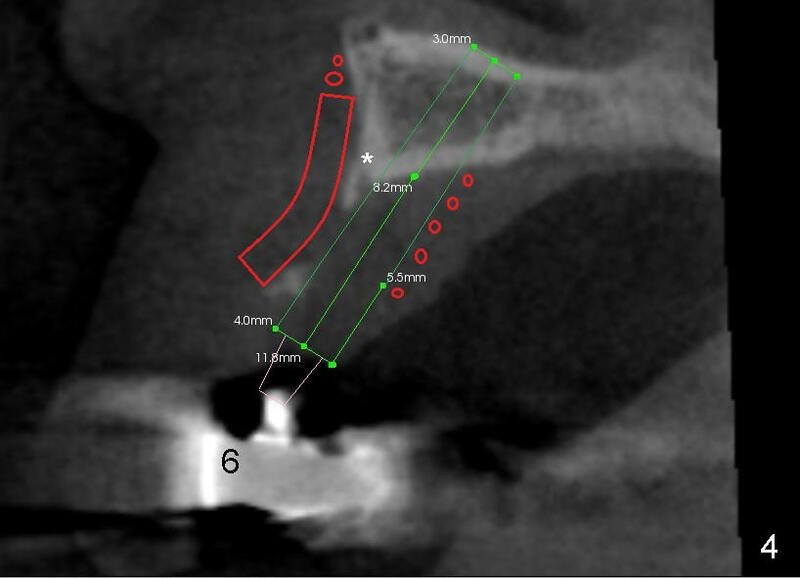 Two implants (Fig.4,5 green outlines) are to be placed palatal to the atrophic buccal plate (*) so that straight temporary abutments (pink) can be used for immediate provisionals (if primary stability is achieved). 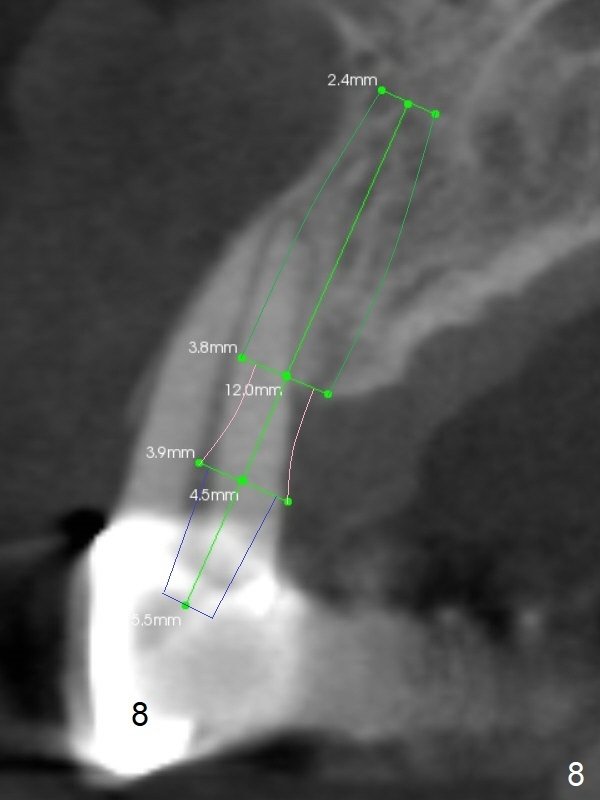 Autogenous block graft is going to be placed buccally (red outline), while particulate allograft (red circles to cover exposed threads) palatally. Collagen membrane will be used. 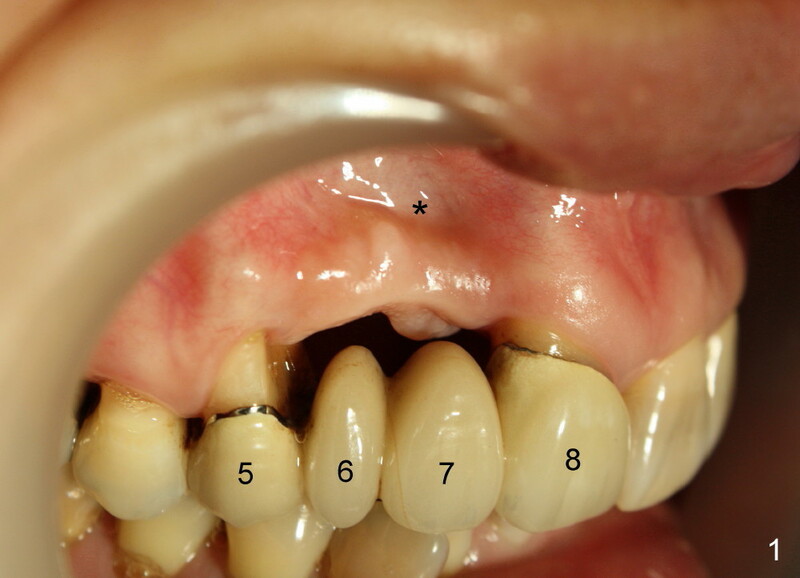 Gingival graft is to cover the mesiaal of #5 and the distal of #8 (Fig.1). The provisionals are going to be splinted. 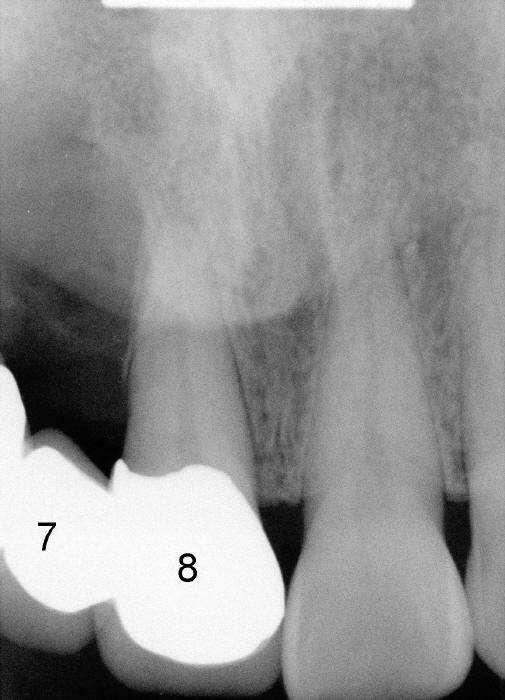 One year post RCT, the tooth #8 has had two episodes of infection. 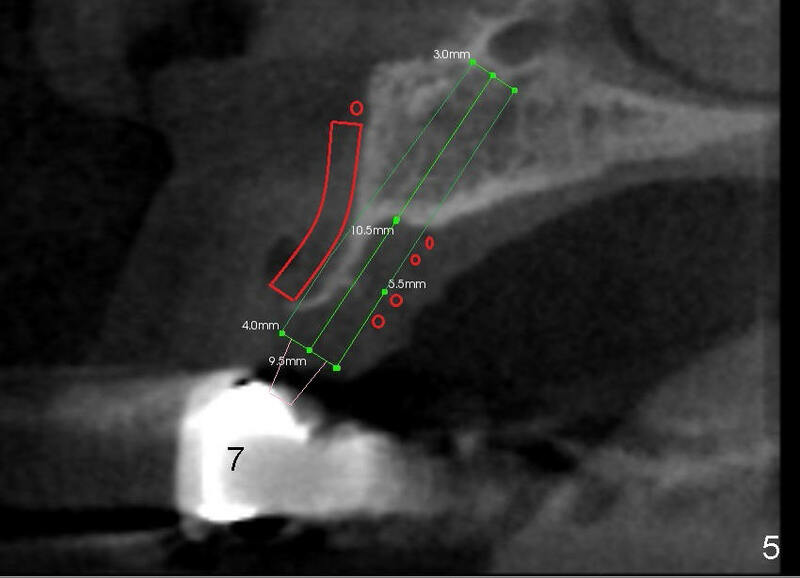 Extraction and implant appear unavoidable (Fig.8). The bridge will be sectioned between #5 and 6. 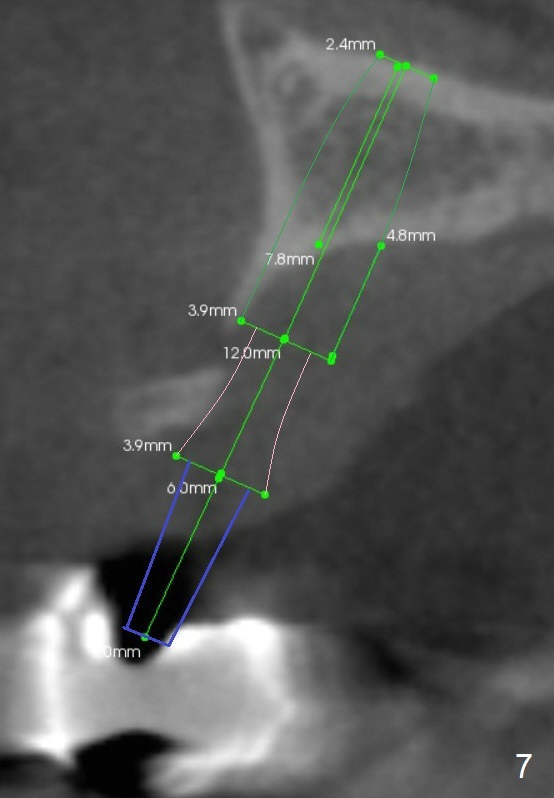 With an abutment with 6 mm cuff or mill one, a bone-level implant at #6 (Fig.7) has lower chance of implant thread exposure than the tissue-level one (Fig.4). Draw 2-4 tubes of blood for PRF. 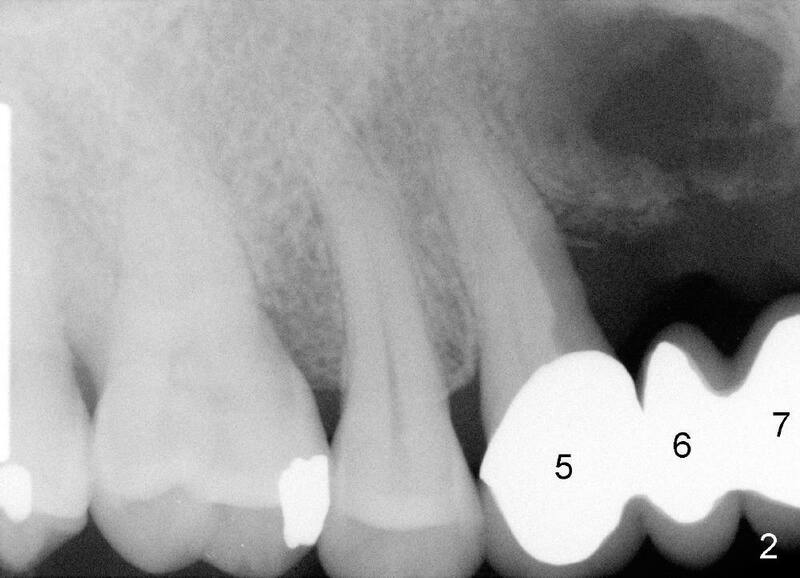 Bone graft the labial concave area (Fig.1 *).